One hundred and ten days, that's all that's left until Adam and I get married! Yikes! It seems like there is just so much to do! We've made all of the big decisions and paid most of the deposits, but one of the problems with organising a wedding overseas is that it's hard to get a vision of what it's all going to look like. I don't have much of a talent for visualising things, which would really come in handy for planning this whole thing. But at least I've got my dress sorted. FINALLY!! I can't tell you the issues I had with finding a dress, it did not come easily to me. Don't get me wrong, I found lots of dresses I loved, but I found it really hard to come to terms with spending so much on a dress that I'm going to wear for roughly six hours. I wanted something that I really loved, but that didn't break the bank. It didn't help that the first dress I tried on was a Jenny Packham - it was a bad idea to let a three thousand pound dress set the standard. I have found one now, and it's such a relief. After I made a decision on the dress everything else started to fall into place - I don't know why it worked out that way but it did. And luckily enough I managed to get some beautiful bridesmaid dresses from the same place! Fingers crossed they fit though - yet another issue with having an international bridal party! 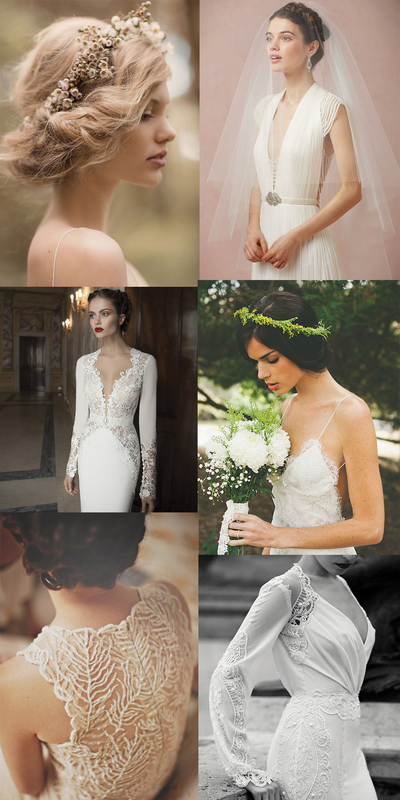 Above are a few styles I had in mind while I was looking for a dress, all taken from Pinterest of course! I think the one I've gone for encompasses the easy-going garden wedding feel we're going for, and I am so excited to share it with you all. Only 110 days to wait!